The Caldera 12 point, 14 millimeter Thin Wall Spark Plug Socket is designed to fit certain cars with 14-millimeter, 12 point spark plugs. This socket is primarily designed to work with 2007+ BMW 3.0 liter engines such as the N52, N54, and N55. It is also compatible with certain Toyota and Nissan vehicles, along with some BMW motorcycles. This socket has been designed to be as narrow as possible in order to fit into the specialty plug cavities on some vehicles. This socket has also been designed with metal "leaf spring" retainers inside the socket to hold onto the spark plug. The leaf spring system is superior to using a magnet, because magnets can sometimes break off of the socket, and the leaf spring system provides a much stronger hold and more long term durability. 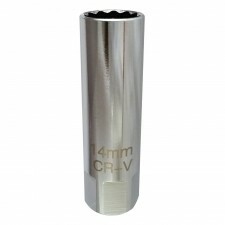 This thin wall spark plug socket is crafted out of chrome vanadium steel. The Caldera Thin Wall Spark Plug Socket fits a 3/8 inch square drive.